Don't want to sign up, but just want to contact us? Just click the contact button and ignore this box. Private Barcelona Walking Tour Includes: Our upscale and private Barcelona walking tour includes the service of private tour guide, public transportation fare. Note: The order of visits may vary. This private Barcelona walking tour was designed to take advantage of Barcelona’s excellent public transit system and pedestrian-friendly zones, while still incorporating some of the city’s most important sites, namely the Old Town and the Sagrada Familia church. 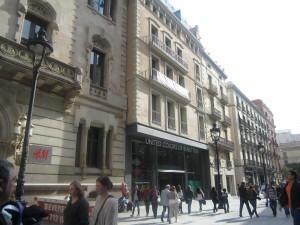 This private Barcelona walking tour starts and lingers in the maze of narrow lanes making up the Old Town (Barri Gotic). Your private expert guide will take you on a walk past ancient Roman walls to the Gothic Cathedral, pointing out the gargoyles of domestic and mythical animals on its roof. You will also walk past such historical landmarks as the former Royal Palace. Next stop in your private Barcelona walking tour will be the Sagrada Familia Church, Barcelona’s key monument and the creation of the modernist architect Antoni Gaudí. You will get a 360-degree view of the building’s unusual exterior as your guide shares with you a bit about the life and times of Barcelona’s most famous architect. A short metro ride will take you to the Passeig de Gracia, Barcelona’s most elegant avenue, to discover two other important architectural works by Gaudí: La Pedrera (Casa Milà) and Batlló House. You will also see some of the best examples of early 20th century architecture in Barcelona here.